The instructions are very basic. In essence, eliminate anything with added/refined sugars from your diet for 30 days [you can decide to reduce or extend this time]. This means reading ingredients on everything you eat. This is important, because so many things have sugar! Trust me, things you may not even consider, are loaded with sugar. Even saltine crackers have sugar. Who would have thought, right? So, the best thing to do to assure you don’t consume added sugars is to read labels. Stick with foods that have no added sugar. This means choosing sugars that naturally occurs in food, like fruits. Some people may decide to keep natural sweeteners (i.e. raw honey or pure maple syrup) like my boyfriend has, but I decided to eliminate this as well. That’s a personal choice. I was just consuming too much of it before and wanted a break. Just be cautious of the type of honey you purchase as some of it may contain added sugars. A food contains added sugars if the ingredients list contains any of these listed below. Take a picture of these or jot them down so you always have this list handy at first. You’ll soon learn them. 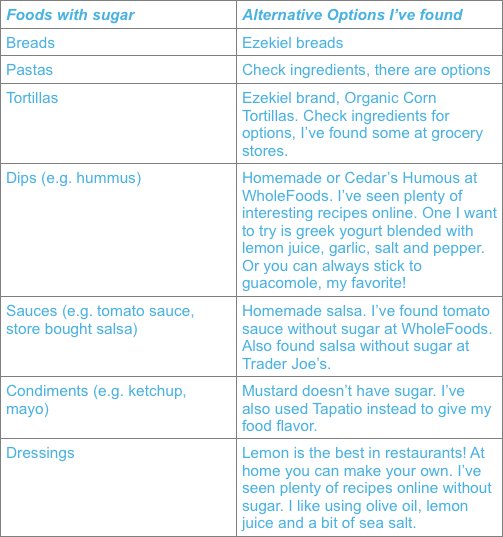 The following table will give you information on some of the more popular foods, aside from the obvious sweets, that contain hidden sugars as well as a list of some alternative options for each. To clarify a popular misconception, lactose – found in dairy products – is also a sugar, but a naturally occurring one. Some people may be more sensitive to this, so as part of being an intuitive eater, listen to your body when consuming dairy products. Based on this, you may decide to keep or eliminate it [or save it for our dairy detox next!]. So just to be clear, this program is not a diet, it’s a detox. It is part of intuitive eating. Eliminating a particular food for a specified period of time then reintroducing it to see how your body reacts. This process of eliminating sugar could give your body amazing results, as it did with mine, but more importantly you will learn your body’s reaction to the detox. Once the 30 days are over and you begin reintroducing added sugars you will see first-hand how it affects your body. At this point you can decide what to do next, decide which alternative options you want to keep for good. The detox may become the beginning of a new lifestyle for some, and that’s the biggest payoff of becoming an intuitive eater. You let your own body do the talking. And remember to focus solely on eliminating this food for now, and see how your body reacts to this. Enjoy the changes this detox will bring and feel free to share the information with friends and family, because they will surely ask about these changes they are seeing in you. Good luck my friends!! And stay tuned for posts from my boyfriend and I as we start week two of our sugar detox. Posted in Health & Nutrition and tagged health, intuitive eating, nutrition, sugar detox. I’ve been wanting to start a sugar detox for sometime now. Thanks for sharing your experience and tips I feel like I’m ready to start my detox! !